This weekend included many more or less unusual happenings. One of these took place when my friend Stine Renate and I visited the Historical museum in Oslo. The museum is a beautiful building, built in 1903 in a monumental and yet friendly style, and filled with magnificent architectural elements. The architect, Henrik Bull, especially paid much attention to the details in the building, applying a decorative style that mixed ancient Nordic ornamentation with the aesthetic of Art Nouvau, and utilising plaster mouldings, carved stone, stucco marble, oak wood and stained glass among other fine materials, he gave this grand building a human scale. While pretending we didn't know we were sneaking into rooms we weren't supposed to be in, we discovered this owl. 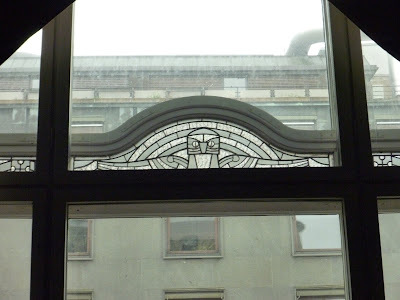 We never figured out why he was so strict, but afterwards, we noticed owls everywhere in the building's ornamentation, including one flying upside down, and (a granite) one holding up a column in the staircase. The owls are supposed symbolically to represent wisdom, I guess, but the symbolic part really doesn't matter very much to me, as they look cool and bring the building to life anyway. I can't help but finding these sorts of elements in Art Nouveau and other kinds of ornamented architecture infinitely charming; and I guess there might be something in the way they seem to watch over the building and its surroundings. Owls are you're university symbol? !